in the U-Today’s column Meet the Teacher, I talked about what makes me tick when teaching computer science. The photo was taken by Rikkert Harink, who also did the excellent DesignLab jump pictures. On December 06 and 07 2016 The Netherlands School for Information and Knowledge Systems (SIKS) and Statistics Netherlands (CBS) organize a two day tutorial on the management of Big Data, the DataCamp, hosted at the University of Twente. The Data Camp's objective is to use big data sets to produce valuable and innovative answers to research questions with societal relevance. SIKS PhD students and CBS data analysts will learn about big data technologies and create, in small groups, feasibility studies for a research question of their choice. Participants get access to predefined CBS research questions and massive datasets, including a large collection of Dutch Tweets, traffic data from Dutch high ways, and AIS data from ships. 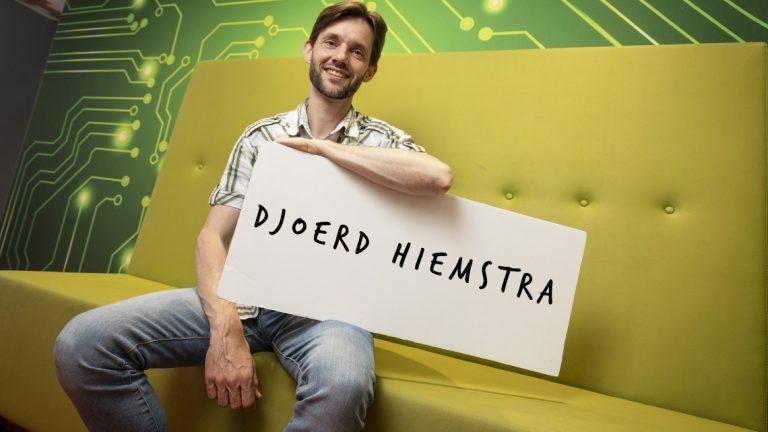 Participants will get access to the Twente Hadoop cluster, a 56 node cluster with almost 1 petabyte of storage space. The tutorial focuses on hands-on experience. The Data Camp participants will work in small, mixed teams in an informal setting, which stimulates intense contact with technologies and research questions. Experienced data scientists will support the teams by short lectures and hands-on support. Short lectures will introduce technologies to manage and visualize big data, that were first adopted by Google and are now used by many companies that manage large datasets. The tutorial teaches how to process terabytes of data on large clusters of commodity machines using new programming styles like MapReduce and Spark. The tutorial will be given in English and is part of the educational program for SIKS PhD students. Also see the SIKS announcement. Another thesis prize for Niek Tax: Best master thesis in computer science in 2014/2015 at the University of Twente, awarded by Alumni Association ENIAC. Photo: Niek Tax receives the award from Johan Noltes on behalf of the ENIAC jury. Congrats, Niek! Other nominees were Justyna Chromik (DACS), Vincent Bloemen (FMT), Maarten Brilman (HMI), Tim Paauw (IEBIS), and Moritz Müller (SCS). Niek Tax was awarded today for his master thesis Scaling Learning to Rank to Big Data: Using MapReduce to Parallelise Learning to Rank by the Dutch association for ICT professionals and managers (Nederlandse beroepsvereniging van en voor ICT-professionals en -managers, Ngi-NGN). More information at Ngi-NGN and UT Nieuws. Congratulations, Niek! The TREC Federated Web Search track facilitates research in topics related to federated web search, by providing a large realistic data collection sampled from a multitude of online search engines. The FedWeb 2013 challenges of Resource Selection and Results Merging challenges are again included in FedWeb 2014, and we additionally introduced the task of vertical selection. Other new aspects are the required link between the Resource Selection and Results Merging, and the importance of diversity in the merged results. After an overview of the new data collection and relevance judgments, the individual participants' results for the tasks are introduced, analyzed, and compared. Learning to rank is an increasingly important task within the scientific fields of machine learning and information retrieval, that comprises the use of machine learning for the ranking task. New learning to rank methods are generally evaluated in terms of ranking accuracy on benchmark test collections. However, comparison of learning to rank methods based on evaluation results is hindered by non-existence of a standard set of evaluation benchmark collections. Furthermore, little research is done in the field of scalability of the training procedure of Learning to Rank methods, to prepare us for input data sets that are getting larger and larger. This thesis concerns both the comparison of Learning to Rank methods using a sparse set of evaluation results on benchmark data sets, as well as the speed-up that can be achieved by parallelising Learning to Rank methods using MapReduce. In the first part of this thesis we propose a way to compare learning to rank methods based on a sparse set of evaluation results on a set of benchmark datasets. Our comparison methodology consists of two components: 1) Normalized Winning Number, which gives insight in the ranking accuracy of the learning to rank method, and 2) Ideal Winning Number, which gives insight in the degree of certainty concerning its ranking accuracy. Evaluation results of 87 learning to rank methods on 20 well-known benchmark datasets are collected through a structured literature search. ListNet, SmoothRank, FenchelRank, FSMRank, LRUF and LARF were found to be the best performing learning to rank methods in increasing order of Normalized Winning Number and decreasing order of Ideal Winning Number. Of these ranking algorithms, FenchelRank and FSMRank are pairwise ranking algorithms and the others are listwise ranking algorithms. In the second part of this thesis we analyse the speed-up of the ListNet training algorithm when implemented in the MapReduce computing model. We found that running ListNet on MapReduce comes with a job scheduling overhead in the range of 150-200 seconds per training iteration. This makes MapReduce very inefficient to process small data sets with ListNet, compared to a single-machine implementation of the algorithm. The MapReduce implementation of ListNet was found to be able to offer improvements in processing time for data sets that are larger than the physical memory of the single machine otherwise available for computation. In addition we showed that ListNet tends to converge faster when a normalisation preprocessing procedure is applied to the input data. The training time of our cluster version of ListNet was found to grow linearly in terms of data size increase. This shows that the cluster implementation of ListNet can be used to scale the ListNet training procedure to arbitrarily large data sets, given that enough data nodes are available for computation. The paper was published at SIGIR 2002 and received an Honourable Mention for the ACM SIGIR Test of Time award at the 37th Annual ACM SIGIR conference on Research & development in information retrieval in Gold Coast Australia on 9 July 2014. The TREC Federated Web Search track is intended to promote research related to federated search in a realistic web setting, and hereto provides a large data collection gathered from a series of online search engines. This overview paper discusses the results of the first edition of the track, FedWeb 2013. The focus was on basic challenges in federated search: (1) resource selection, and (2) results merging. After an overview of the provided data collection and the relevance judgments for the test topics, the participants' individual approaches and results on both tasks are discussed. Promising research directions and an outlook on the 2014 edition of the track are provided as well.